It's NBA playoff time which got me thinking about the spectacle of basketball. At the conclusion of a quarter or half, the last team with the ball typically takes a long desperation shot. The crowd always lets off a collective 'ooooh' even though the shot rarely goes in. This was the genesis of an idea to replace the uneventful jump ball with something I call a fan friendly 'challenge ball' which combines basketball skills and game theory. With a typical jump ball each team selects a player to face-off surrounded by teammates. The referee then tosses the ball up and those facing off try to tip it to a teammate and from there it's a live ball. Technically the ball is not to be tipped until it reaches the apex, but since there's no telling where that is, both players attempt to tip it on the way up and, unless it is blatant, the referees rarely call it. When they do, they often do a re-jump. It's not good entertainment. In place of the jump ball, I propose the challenge ball. Similar to a jump ball, each team would have a single player participate. If the game is in progress, the 2 closest opponents to the action would participate. The last team to possess the ball (or the home team if it's at the start of a game) would select a location on the court to shoot the ball from. His opponent could elect to shoot the ball from that location or decline to shoot and have his opponent shoot. If the shot is made the shooter's team gets the ball. If the shot is missed the opposing team would get the ball. A challenge ball equitably decides who gets possession of the ball and rewards the better basketball player. The first player selects the location. If he selects too easy of a shot then his opponent will elect to take the shot, believing he can make the basket. However, if he selects too difficult a location, his opponent will decline the option to shoot, believing that the shot will be missed. 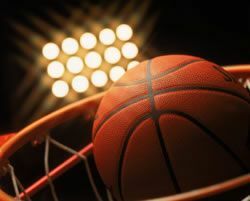 The player possessing better shooting skills will be at an advantage, but there will be an intellectual angle because each player must assess the willingness and ability of the other player in the contest to shoot the ball. Equally important, a challenge ball would make for great entertainment. It's a modified one shot game of HORSE you played with your cousin. Pick-up players who routinely holler "shoot for it" to decide a dispute will immediately associate with it. Only this will involve the best shooters in the world testing their abilities against each other. Who knows where players will elect to take a challenge ball? Since even an average NBA players can reliably make 3 pointers when unaccosted, most challenge balls will be taken well beyond the 3 point line, giving viewers a few more 'oooohh' moments each game and making games even better entertainment. Pro basketball games are exhilarating to watch with arguably the finest athletes in the world on display. Yet there are a few times when they're boring and one of those is the jump ball. A challenge ball will add a tiny bit of intrigue to the game and make for some amazing highlights. I hope you'll give it some thought! P.S. Please do something about proliferation of intentional fouls. That's not good entertainment either.